NEAR (Near Earth Asteroid Rendezvous) was a mission to rendezvous and orbit around an near earth asteroid (433 Eros). On the cruise to Eros, it flew by asteroid 253 Mathilde on 27 Jun 1997 and flew by earth on 23 January 1998. 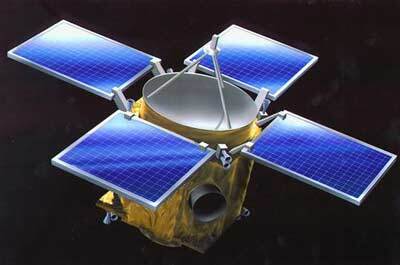 After failing to insert itself into Eros' orbit in January 1999, NEAR finally inserted itself into orbit around the asteroid on the second try on 14 February 2000. Initially in a 323 km × 370 km orbit, it lowered its altitude during observation. After reaching orbit, NEAR was renamed NEAR-Shoemaker. After completing its one year mission, NEAR Shoemaker gently landed on the tips of two solar panels and its bottom edge on 12 February 2001. The spacecraft snapped 69 detailed pictures during the final 5 km of its descent, the highest resolution images ever obtained of an asteroid, showing features as small as one centimeter across. The slow touchdown speed left the spacecraft intact and still sending a signal back to Earth. NASA decided to extend the mission to February 28th, to get "bonus science" from the spacecraft, which had already collected 10 times more data than originally planned. This allowed the gamma-ray spectrometer to collect data from an ideal vantage point about four inches (10 cm) from the surface. internal properties (mass distribution and magnetic field). MultiSpectral Imager (MSI) - a refractive telescope with passively cooled Si CCD array (244 × 537) that will determine the overall size, shape, and spin characteristics of the asteroid, map the morphology and composition of the surface, and search for satellites of Eros.2.25 × 2.9 deg FOV, 10-16 meter resolution from 100 km altitude, sensitive between 400 and 1100 nm. X-Ray/Gamma-Ray Spectrometer (XGRS) - containing two sensors (an X-ray fluorescence spectrometer and a gamma-ray spectrometer), XGRS will be used to determining the surface/near-surface elemental composition of the asteroid. Near-Infrared Spectrograph (NIS) - a spectrometer covering 800-2700 nm, NIS is designed to map the mineralogical composition of Eros. Magnetometer - a three-axis fluxgate sensor that will be used to measure Eros' magnetic field. These measurements will help determine the internal composition of the asteroid. NEAR Laser Rangefinder (NLR) - an altimeter that uses a solid-state pulsed laser to measure the distance between the spacecraft and the surface of the asteroid. It will be used to make will make accurate measurements of the asteroid's shape and detailed surface structure. Nd-YAG laser operating at 1.064 mm wavelength, 6 meter resolution, 50 km range. Radio Science - uses the satellite's telemetry system to map Eros' gravity field.